Whenever I listen to early music from North Africa, even the classical pieces with piano by Algerian singer Mahieddine Bachtarzi, I find myself reminded how different North African music is from classical Arabic music. To my amateur ears, it comes with an entirely different set of influences, though there are similarities at the same time. One of the most obvious influences on North African music is indigenous Amazigh culture, and this piece is a prime example of Amazigh music captured in Morocco in the early days of the recording industry. Though they are still used interchangeably, I am using the term “Amazigh” as opposed to the frequently used “Berber,” as many Amazigh believe the term “Berber” to not only be pejorative, but also a name foisted upon them by other cultures. Morocco gained independence in 1956, after having been a French and Spanish protectorate. In the Souss Valley, and in the Atlas Mountains of southern and southwestern Morocco, live the Shilha Amazigh (also known as Chleuh, and Ishlhin). Their native language is tashlhit, an Amazigh dialect. The musical traditions of the Shilha are rich. Small groups of professional Shilha musicians are known as rwais. The singular of the term rwais is raïs, and raïs refers to the leader and person in charge of the repertoire and poetry used in the group’s material. Hence our group’s leader: Raïs Mohamed Ben Bihi. Generally, there is a repetitive, call-and-response quality to all the early rwais music that I’ve found, or have heard. The primary instruments used in a rwais ensemble are the rribab, the one stringed fiddle from the region made of walnut and olive wood, the lotar, which is a four-stringed lute with an enamel soup bowl as a resonator, and the naqus, which is a percussive bell that is played with a metal rod. The raïs sings his poetry line by line, and very often the chorus repeats it, line by line. I chose this piece, however, because it’s an instrumental, and it features another instrument used by the rwais ensembles which is not as often featured on early recordings: the haha, a flute used in the Essaouira region (thanks to reader ‘asklu’). Accompanying the flutes are two types of drums, though I’m not sure which ones – possibly the tallunt frame drum. 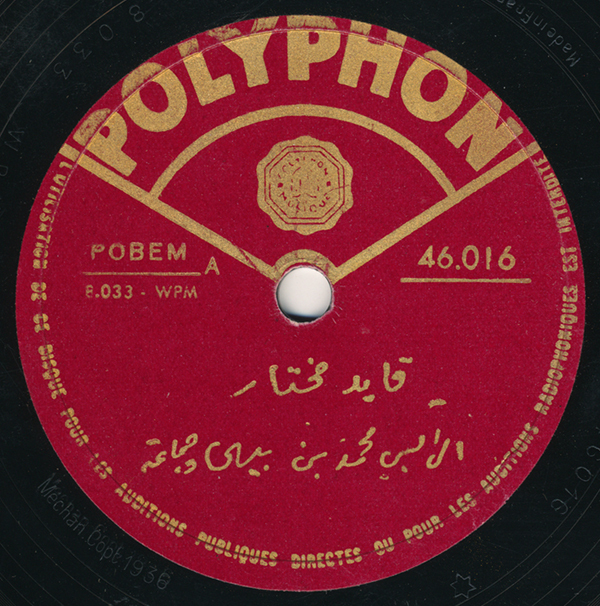 Polyphon, the French-run label related to Polydor, recorded this piece in 1936, probably in Marrakech. The first rwais recordings were made by Pathé only about 10 years earlier, and featured the artists Raïs Abdallah Enaïr and Raïs Elmokhtar Ben Saïd. The Gramophone Company followed suit, recording rwais troupes in 1929. In 1938, the Baidaphon company’s Paris outfit recorded the famed El-Hadj Belaïd, who even recorded a song about his travels there: “The Trip to Paris.” On the one hand, it’s interesting that recording of such a large cultural group that was easily accessible in major Moroccan cities did not begin until the mid- to late 1920s. We know that companies such as Polyphon and other European multinational recording companies were driven to find new markets, if they existed. In the late 1920s, Sub-Saharan recording began in vigor, and previously that was a recordist’s no man’s land. Perhaps the same feeling existed with regard to the non-urban music of Morocco. I suppose we can only be thankful that they began recording rwais groups when they did. Rwais performances are, like so many other local styles of music, traditionally long-form styles. The 78rpm record can only capture a snapshot of the reality of a live performance, so we are left with mere snippets. The Polyphon label has remained an idiosyncratic favorite of mine, when it comes to the recording of small troupes across North Africa and elsewhere. For some reason, they chose to record in some of the most sonorous, gigantic recording spaces that must have been available. In some cases, particularly with large ensembles, this was a terrible choice, with the result sounding like mud. But for small troupes (including the Arab-Andalusian and raï music from Algeria recorded during the period), it worked magically – even with a little over-modulation. Much info gleaned from the articles and dissertation by Philip Daniel Schuyler. Fantastic record – and against all the odds it does seem to capture some of the excitement and vitality of the music as it might have been heard in its natural environment. Great sound and ambience, too. Thanks, as ever. This is a great post Jonathan, I’ve been visiting it off and on over the past couple of weeks and haven’t gotten around to leaving a comment…I agree with CC, this piece really could be much much longer. I’ve been listening on loop often. inevitably my mind wanders off to a paul bowles story. thank you for this wonderful music. Je vous remercie! J’ai changé le texte.